This page describes the way to enable OpenEXR on OpenCV. I checked in the following environment. Please download the following files from OpenEXR Official site. Please download the following file from zlib Official site. Please extract the above files and placed as follows. Please extract ilmbase-1.0.2.tar.gz and open the following file in Visual Studio. Please build the solution with the following settings. After the building, Deploy directory is created. Please run the following command. Please open the following file in Visual Studio. Please build the zlibvc project with the following settings. Please copy the following DLL to Deploy\bin\Win32\Release. Please copy the following libraries to Deploy\lib\Win32\Release. 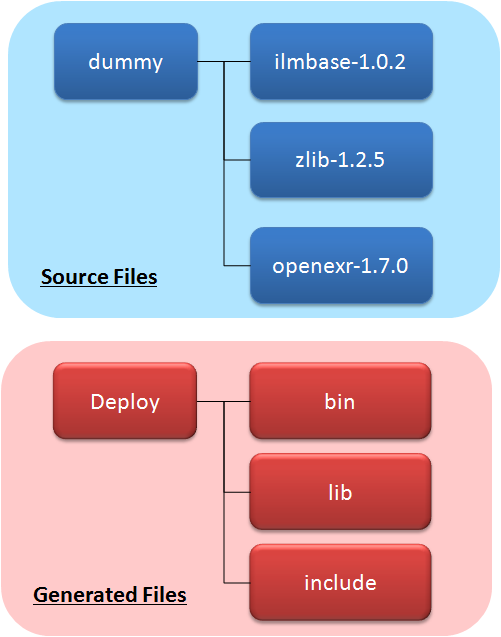 Please copy the following header files in zlib-1.2.5 to Deploy\include. Please extract openexr-1.7.0.tar.gz and open the following file in Visual Studio. Please build the IlmImf? project with the following settings. Please enable WITH_OPENEXR on CMake. Please specify the include path and library for OpenEXR in the Deploy directory. Please add the following file to opencv_highgui project in OpenCV.sln as a linked library. Please build the OpenCV with the following settings. Please extract the following zip flie. I describes a sample program to read OpenEXR image. If you have question，please send e-mail to the following address. PukiWiki 1.5.1 © 2001-2016 PukiWiki Development Team. Powered by PHP 7.1.26. HTML convert time: 0.027 sec.